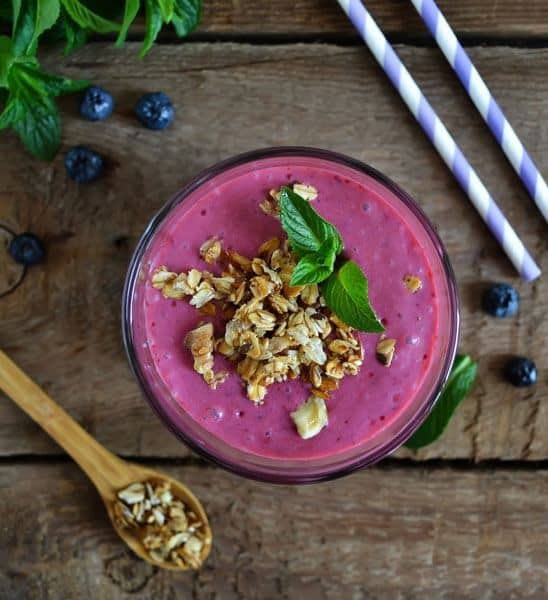 Does a Smoothie Only Diet Really Work? The Truth About Liquid Weight Loss Plans! If you’re like me, living an on-the-go lifestyle, you might have already discovered that smoothies are the perfect solution for helping your nutrition fit into your busy routine. If a smoothie is such a healthy nutrient bomb, and so quick to make - why not go for a green smoothie only diet? On paper, this might seem like the easiest way to stay healthy if you’re pushed for time and many people do indeed go down this route - unfortunately without knowing much about the potential downsides of consuming exclusively smoothies. There are less drastic modes of liquid diets, which actually make sense for quick weight loss and maintaining a healthy weight - such as the Smoothie Diet found here. This one has good results, but without the risks of an exclusively-smoothie regime. I talk more about it on the second half of this article. You can use the quick navigation below to jump straight to that part if you want. Does an Only-Smoothie Diet Aid Weight Loss? What happens when substituting all meals with smoothies? If you’re considering such a diet change, it’s important you read this article as well as consult a Registered Dietitian, so that you’ll be truly informed about what it could really mean for your health and weight loss efforts. Here’s a YouTube video that might have inspired many to embark on a smoothie-only diet, but you should definitely read till the end before you do! Jenell Stewart has embarked on a 30-Day smoothie diet. She consumed one 16oz smoothie every 2 hours from 8am to 6pm, plus 1-2 servings of fruit and a nut bar - that’s it for 30 days. Firstly, there is the convenience factor. One of the reasons why smoothies are so popular is the ability to pack in a host of key vitamins and nutrients quickly and easily. If you don’t have a lot of time to spare on the average day it is an attractive idea, to be able to only drink smoothies and not spend precious time preparing, cooking and eating meals. Secondly, there is the nutrition factor. 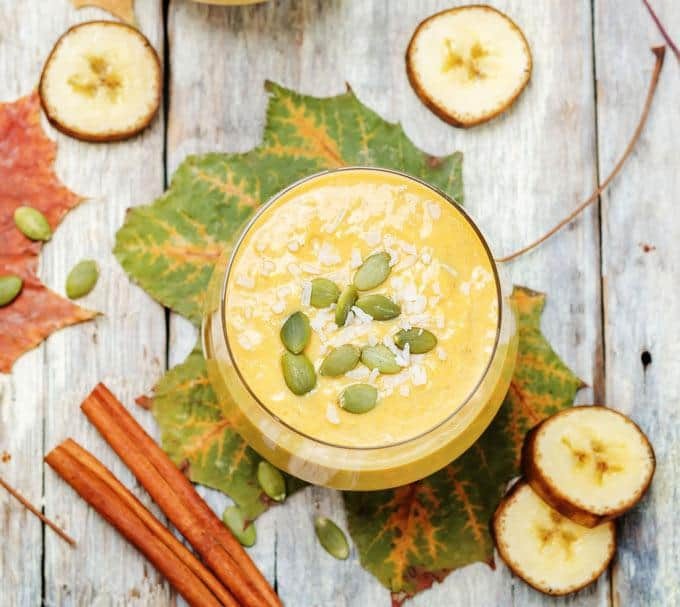 The very idea that smoothies can be so good for you leads many people to believe that they can get even healthier if they stick purely to them. Does it work though? Let's take a critical look at this idea. Her diet started with a 5 day smoothie cleanse which consisted of eating nothing but liquid smoothies. Then she gradually moved on to small meals, but still with smoothies as the main nutrition source. Due to it being such a drastic regime, and considering most of us are not obligated to fulfill multi-million dollar contracts with Weight Watchers... then that's not something RD's or physicians would usually recommend. In moderation, smoothies are an ideal way to drop a few pounds without sacrificing on the nutrition side of things. You can just swap out a meal in favor of a delicious smoothie and still be assured that you’re getting vital nutrients. The calorie difference generally means you’ll lose some weight into the bargain, and if that’s not enough - many smoothie recipes are designed to keep you full for a long time, so you can avoid casual snacking. So to the question "Do smoothie diets work?" we'd say "yes", but as always the devil lies in the details. If you’re substituting all of your meals for smoothies, the picture looks a bit different and losing weight actually becomes a lot more difficult. The amount of calories in the average vegetable smoothie isn’t high. This can be great if you’re trying to get to a target weight. ​If you’re going to consume only smoothies, and for the long term, then you’re more likely to lose muscle rather than fat. This is important as lean muscle can burn more fat so if yours depletes, your effort to lose weight would be less effective. Fruit and vegetables are mostly made up of water and fiber. This means they bulk out your smoothies while also being light on calories. The average green smoothie is a maximum of 300-400 calories, depending on ingredients of course. If smoothies are all you’re going to be eating over the whole day, even 3 smoothies mean you’ll be getting less than 1500 daily calories. Even if weight loss is your aim, this isn’t enough to sustain you day in, day out. Anything below 1500 calories per day for men and 1200 calories per day for women is generally considered to be a low calorie diet. Truth is, you’ll be hungry - no matter what goodies you pack into your smoothies to try to fill you up. There’s much more chance that your good intentions will go up in smoke when you think of it this way. Even worse, low calorie diets like the smoothie only diet can actually make weight loss more difficult to achieve. Your body goes into “starvation mode” if it’s deprived of calories in this way. This basically means that it hangs onto fat for as long as possible so that you can continue to function reasonably well on this lesser amount of calories. This could be useful for survival, however it is not so great if you’re on a weight loss mission. Your metabolism slows down as a result of the calorie deprivation and weight loss gets harder and harder. Once you go back to a more normal pattern of eating, you’ll put weight on … much more than you bargained for, most probably! What if you don’t go back to a “normal” eating pattern? Chances are, you’ll experience some of the nutritional deficiencies that are discussed in the next section! Smoothies are a great way to easily pack some extra nutrients into your day but they won’t provide you a full array of nutrition. This means you’ll have deficiencies in certain nutrients if you exist solely on smoothies. Low calorie diets like this can often lead to mineral deficiencies, and plant based diets can increase the potential for iron and zinc deficiencies too. Iron and calcium can be there to some degree in green smoothies but you’d need a lot of things like kale to get the amounts you need. As an exclusively-smoothie diet is classed as a plant based diet, not getting enough protein can also be a problem. This can lead to physical symptoms such as tiredness, having little energy and a “fuzzy” head. Lack of protein can also slow down your metabolism and have an even bigger effect on your weight loss efforts. Generally, vegans and vegetarians who follow a plant based diet will get their protein from other sources but obviously this won’t be an option if you’re following a smoothie only diet. You’re therefore more likely to be lacking in it compared to them. Adding protein powders to your smoothies is a way to get protein into a smoothie only diet but I believe it should come as a protein boost rather than a substitute for eating protein-rich foods. At the other end of the spectrum, replacing all daily meals with protein shakes also has its health risks. The “5 Day Protein Shake Diet” is an example of such a regime. The idea is to consume five protein shakes a day for five days, or for another limited period of time, under medical supervision. The shakes have very low sugar contents and only little carbs and fat, and thus very low on calories - around 600 to 1400 per day. This diet has been found to be very effective, but unfortunately it can lead to serious side effects such as abnormalities of the heart and cognitive dysfunction caused by nutrient deficiencies. A slightly more balanced version of this diet calls for two smoothies a day and one meal. This is still a smoothie fast, but at least you get to catch up with some of the required nutrients while eating a regular low-calorie meal. 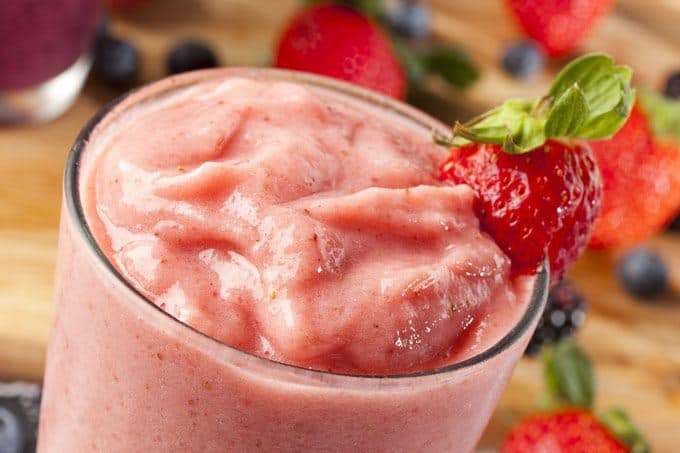 The fruits and veggies you put in your smoothies might have started out life as solid foods but once they’re blended, they’re essentially liquid. This is where some of the problems of a smoothie only diet start from. Our bodies simply weren’t designed for our food to be consumed purely in liquid form. Research done on mice has shown this kind of diet to have a negative effect on their digestive system. The problem here is that you would not secreting bile from your liver as you normally would, which your body needs for digestion. The end result? You’re at much higher risk of developing gallstones, and the oxalates found in some dark green leafy veggies might build up and cause kidney stones. It won’t happen to everyone, but it's another risk of going on an extreme kind of diet. 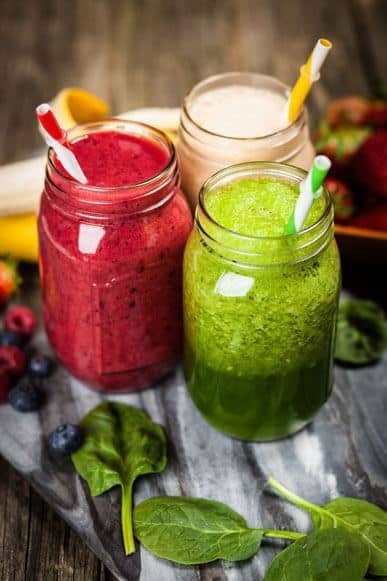 Thus, even though consuming one, two or even three smoothies a day can greatly benefit your health, replacing all meals with smoothies is having “too much of a good thing” - which as usual - is not so great. Rather than trying to exist solely on a smoothie only diet, you’re much better off replacing just one or two meals per day with smoothies and having the other regular meals - lunch or dinner. This way, you’ll get a healthier number of calories to avoid “starvation mode” and fill you up, and a better chance at an overall balanced nutrition. You also don’t have to worry about the potential for being deficient in important nutrients as you can make sure that these are included in your main meal. It’s never advisable to make any big changes to your diet without consulting a professional RD beforehand. Embarking on a smoothie only diet definitely falls into this category as it’s liquid only and considered to be at the more extreme end of the scale. 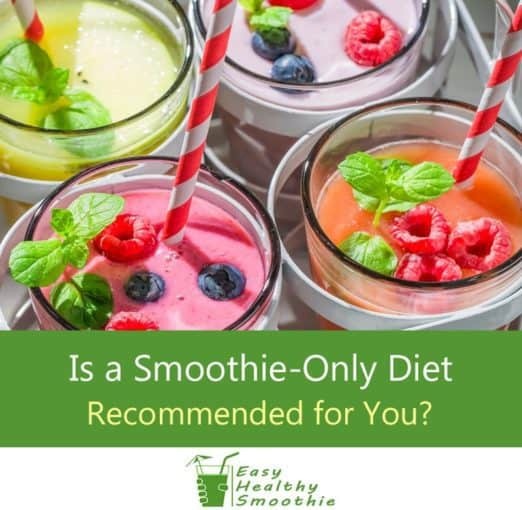 As you’ve probably realized by now, I’m not in favor of a smoothie only diet as there are too many potential problems associated with it and it’s not a sustainable weight loss plan. It’s also contrary to my view of having your nutrition as a source of fun and enjoyment in your life. This can be achieved with more variety in food selection and serving, enjoying different flavors, textures and food styles. However, I do love swapping out a couple of meals for smoothies, mainly breakfast and sometimes lunch, or drinking an extra smoothie in between. This helps me to feel full and keeps me going until dinner. Plus, I know I’ve already got all of my key nutrients in before I sit down for my main meal of the day. So, if you're going to try a smoothie-based diet, you may as well follow a program that has every detail into account. Starting a diet based on smoothies, being consistent with it and then sticking with it for the long term to keep a healthy body weight - these need a plan, guidance and support. 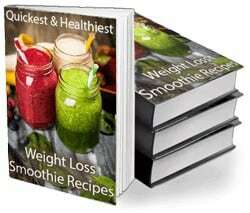 That’s where you need something like the "Smoothie Diet" package, which I’ve reviewed and scrutinized for you here. A customized weight loss plan developed by certified health coach (CHC, AADP) and nutrition expert, Drew Sgoutas. 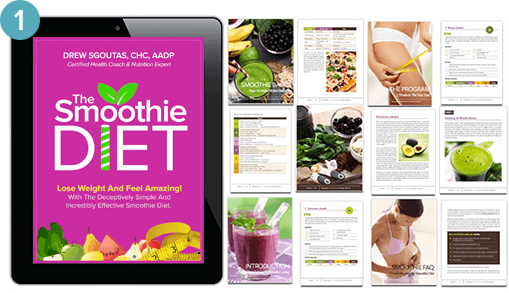 This is a 3-week program that uses smoothies as the base for losing weight and maintaining a healthy body weight for the long term. You get everything you need to succeed and lose weight - from recipes, shopping lists and motivation, to personal access to health coach Drew for any questions or help you might need. This weight loss program is based on solid and proven principles, developed by a nutrition expert. It seems genuine, and presented by a real person using his real name and professional credentials, which instills trust and authority. This is an in-depth plan that’s well researched and presented. See below for our full review of what you get in the package and the benefits of using the program. Downloadable product, not a physical book. However you can print it if you wish, or just use with a laptop, tablet or smartphone. The package you get with this program is jam-packed with content. I found the content to be of high quality, and thoroughly enjoyed reading it. Chapter 2 - Smoothie Basics. Everything you need to know to make the perfect smoothie. Chapter 3 - The Smoothie Diet Program. Main part with a 3-week plan. Chapter 4 - Troubleshooting the Smoothie Diet. How to easily overcome diet hurdles. Chapter 5 - Conclusion. Motivation and tips. All in all I believe this is definitely a weight loss and weight management program to try. Glad we could help, Lucy! I’ve settled on having up to two smoothies most days. Don’t think I could hack replacing all of my meals with smoothies and it doesn’t sound a great idea anyway. A smoothie only diet is pretty extreme and as we said in the post, not the most sustainable diet either! We recommend just swapping out one or two meals a day at most and mixing it up with wholesome, healthy food the rest of the time. Much as we love our smoothies, it’s not all that healthy to only focus on them! Thanks for this! I want to lose some weight and I wondered if a smoothie only diet was the way to go so I’m glad I read this first! Thanks for your comment, Claire! It can be tempting to try a smoothie only diet in the hope you’ll lose weight quicker but as you can see, we don’t recommend it. I must admit I’ve thought about going down this road on more than one occasion so I’m really glad you put this post together to discuss it in depth. I think I’ll carry on swapping out some meals for smoothies but not go too crazy – thanks! Moderation is definitely key, Donna! Glad you found the post helpful. 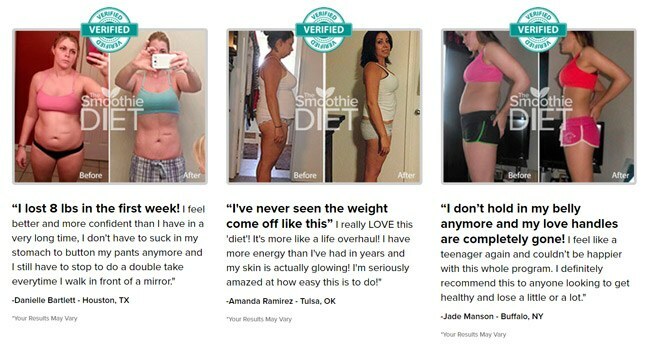 I found this really interesting … I had no idea a smoothie only diet could have so many negative effects! Glad you liked the post, Jason! Smoothies are great in moderation but it’s scary how unhealthy they can be in excess, right? followers! Exceptional blog and brilliant design. My wife has lost a lot of weight with the smoothie diet. Thanks for sharing such an interesting and helpful information. I really like the way you have explained positive & negative aspects of liquid diet.I also appreciate the work that you have put in this page. Great article, reminds me a bit the fat adapted approach we used when I did the bellyproof method with my friend. What I really like about this article is that is touches on some practical ways to do high fat low carb and that really hit base with me and my past experience. Eat two nutrient-dense solid mals each day.